Is It Good? Oh, Killstrike #1 Review – AiPT! How awesome was the 90’s for comics, right?! From Rob Liefeld to…wait…I should just stop. Okay so the 90’s had its fair share of beefcake heroes who had muscles on top of muscles, gun belts on every inch of their anatomy and plenty of attitude to go around. Basically mindless action for a specific type of male…and this comic is a direct parody of that. Question is, is it good? This comic opens on a guy named Jared who has just discovered a very crappy comic is selling for 100 thousand dollars online. It’s called Killstrike and the reason it’s worth so much is because everyone trashed their copies back in the 90’s because it was so darn bad. All he has to do is head to his mom’s house and grab his copy. He’s also a new dad and appears to be shirking his responsibilities a bit. That gives the character some color, but when he goes to open his pristine copy of Killstrike #1, the main character literally jumps out and changes his life and probably not for the better. The plan…it was so easy! Writer Max Bemis opens the book with the basic plot that kicks things off, but then delivers a full page history of the douchebaggery of 90’s comics. It comes complete with an X-Men reference, the boring nature of 70’s comics and the bloggers who revel in the terrible comics of the 90’s. At the end of the day though the creator who takes the biggest hit, indirectly anyway, is Rob Liefeld. No, Bemis never outright says it, but just look at the character that is Killstrike. He’s absurdly huge to the point of being comically unrealistic. He’s also carrying some body tattoos that are reminiscent of Liefeld characters and he’s as dumb as bricks. If you ever found yourself hating on Liefeld characters, now is the time to read this comic. On top of making fun of the comic industry Bemis also litters the comic with comical moments reflective of chauvinism, the joy characters used to take in murdering and ultimately the absurdity of Killstrike himself. The character is slightly aware of his absurdity, which lends to many chuckle inducing moments. Most moments are chuckles over outright laughs though, but by issue’s end you’ll have laughed enough to make this worth a purchase. Plus it’s a rather original meta story too. The art by Logan Faerber works well for the material—just cartoony enough to remain absurd, but also realistic enough to be a good medium between the real world Jared lives in and the comic book world Killstrike is from. Faerber tends to fill panels with Killstrike which makes him that much larger than life and a reminder that what is happening is definitely not normal. He also draws Jared very well with an attention to detail—hairy arms, wrinkles on his face, and more small details make him appear real. 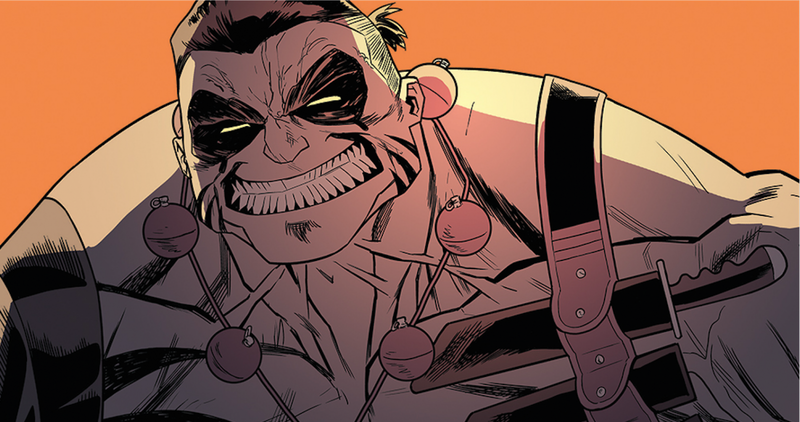 Oh, Killstrike is a fun idea written for comic book readers from the 90’s with plenty of chuckle-inducing moments to make everyone smile.